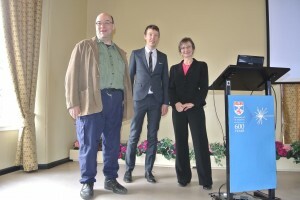 CHI is the premier international conference on human computer interaction, and this year’s event is looking to be the most exciting yet for the St Andrews Computer Human Interaction (SACHI) research group in the School of Computer Science. Seven members of SACHI will attend CHI in Paris this April to present three full papers, one note, one work in progress paper and five workshop papers. In addition members of SACHI are involved in organising two workshops and one special interest group meeting. Two academics in SACHI are Associate Chairs for respective sub-committees and two PhD students will be serving as student volunteers at the 2013 conference. A very busy time for all! Please note that the school of Computer Sciience is going to be introducing a new Masters in HCI from September this year. 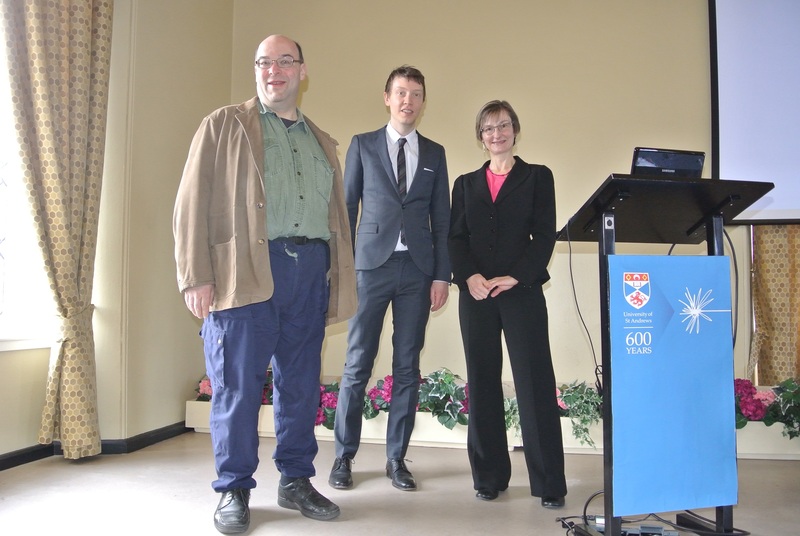 Professor Steve Linton and Dr Adam Barker with Professor Muffy Calder. Formal methods are traditionally used for specification and implementation in a waterfall model. In contrast, I am interested in formal models of concurrent, interactive systems that may/may not be in software, and may already be deployed, i.e. they are systems to be observed. Can formal models and reasoning expose how a system actually works? Can formal models and reasoning suggest improvements based on how a system is actually used? In these talks I will investigate these questions through case studies, from biochemical signalling pathways, to wireless home networks and (shock horror) mobile app games. The talk discusses my experiences starting-up, running, and winding-down a company spun-out of a university. I’ll be concentrating on the business side rather than the technology. Dharini Balasubramaniam, Graham Kirby, Kath Mickan – University of St Andrews, Brian Warboys, R. Mark Greenwood, Ian Robertson, Bob Snowdon – University of Manchester and technologies developed by some of the above and Alfred Brown, Al Dearle, Richard Connor, Quintin Cutts, David Munro and Stuart Norcross – University of St Andrews. Obesity, poor diet and lifestyle and the associated health care costs are set to cripple the governmental budgets of most Western countries over the coming decades. The facts of the equation are simple. Energy intake must exceed energy output for weight loss, and living within a healthy weight range has a host of benefits. Most communities understand and acknowledge the facts, but despite their understanding continue to live lifestyles that endanger them in the long term. In this talk Jill Freyne will walk us through two case studies for online and mobile dietary interventions and examine the power and weaknesses of the technology in the fight to engage and sustain individuals in lifestyle change. Social network sites (SNSs) such as Facebook and Twitter are used by hundreds of millions of people daily. As such they represent an attractive source of data for research. Many researchers have crawled these SNSs to collect data for projects involving psychology, sociology, health, and of course computer science. But there are many risks to naively crawling an SNS, ranging from data protection and privacy concerns to the reliability of the collected data.